Nitrogen, Phosphorus, and Potassium play a very important role in crop nutrition. In addition to these major nutrients, Zinc is also essential for the plant growth and development. Zinc is required for normal Photosynthesis and is directly/indirectly required by several enzymes systems and for protein synthesis. Zinc is needed for cell expansion, carbohydrate and protein development as well as the production of root growth hormones. 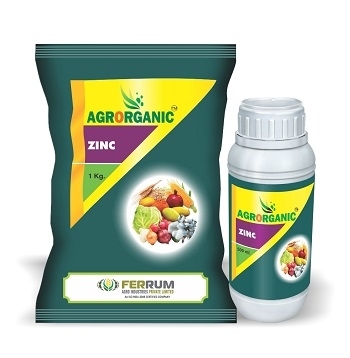 AGRORGANIC® Zinc is combination of Gluconates and Amino acids fortified with Zinc in readily available form. Gluconates and Amino acids help the plant in better growth and also act as a carrier for Zinc for plant uptake. Recommendation: vegetables, paddy, wheat, maize, fruits, cotton and all other crops. - Addresses the zinc deficiency in the crops. - Necessary for energy production, protein synthesis and growth regulation within plants. - Supports root growth and increase leaf size. - Enhances production of Auxins, an essential growth hormone. - Necessary for the formation of chlorophyll and carbohydrates. - Increases Nitrogen uptake in plants and increases zinc and protein contents in grain. - Increases the flower formation, fruit set, seed set and rate of maturity which results in higher yields. Dosages will vary based on various Geo climatic conditions and crops. Packing: Liquid formulation is available in 250ml, 500 ml, and 1000 ml packing. Granular formulation is available in 5 kg bags.